The R-PLEX Human BAFF-R Antibody Set includes a matched capture and detection antibody pair and calibrator for the quick and easy measurement of BAFF-R in biological samples. R-PLEX products leverage MSD’s electrochemiluminescence technology for better sensitivity and a larger dynamic range than traditional ELISAs. R-PLEX matched antibody sets enable the development of singleplex and multiplex immunoassays. Individual assays may be developed using MSD avidin- or streptavidin-coated plates. Custom multiplex assays with any combination of R-PLEX analytes, as well as R-PLEX plus U-PLEX analytes can be developed on U-PLEX MULTI-SPOT plates. To learn more about the advantages of R-PLEX products click here. 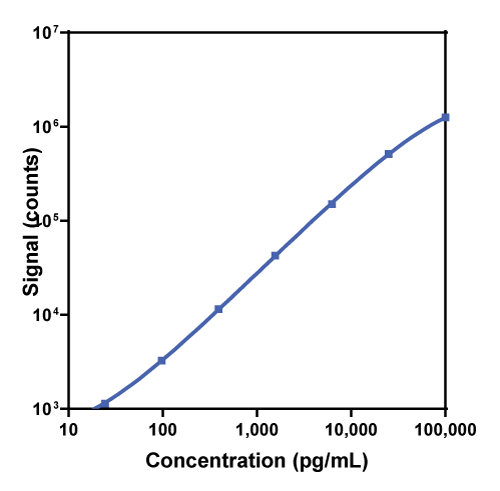 Calibration curve for the R-PLEX Human BAFF-R Antibody Set was assessed and representative data is presented below. Description - B-Cell Activating Factor Receptor (BAFFR, CD268, CVID4, BAFF-R, BROMIX, TNFRSF13C) is one of three known receptors for BAFF, which regulates B- and T-cell function. BAFF-R is required for B-cell maturation and is predominantly expressed on peripheral B-cells. BAFF-R has also been associated with costimulation of T-cells. BAFF/BAFF-R signaling has been widely implicated to play a role in autoimmune conditions in both humans and mice. BAFF levels are significantly elevated in patients with systemic lupus erythematosus, systemic sclerosis, and rheumatoid arthritis.